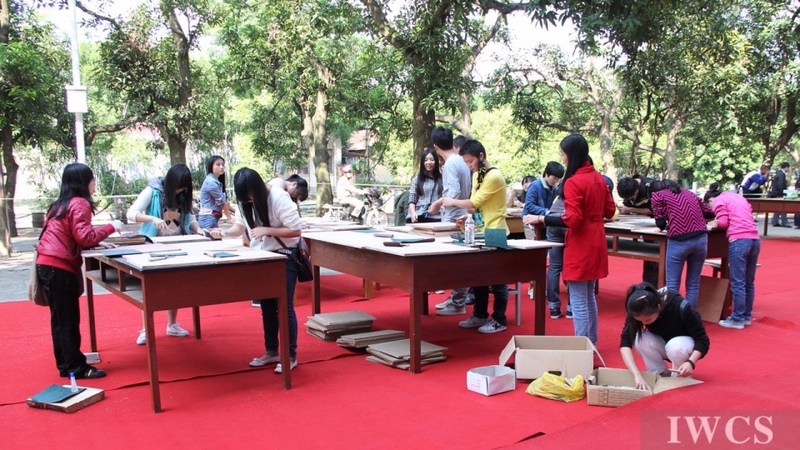 The opening ceremony for the 2013 China-ASEAN Live Wood Carving Exposition and Student Woodcarving Art Festival was held at Guangxi University.The exposition was held in the leafy, shaded square behind the Forestry College at Guangxi University. A large audience, mainly teachers and students, visited the on-site wood carving show over the first 2 days. 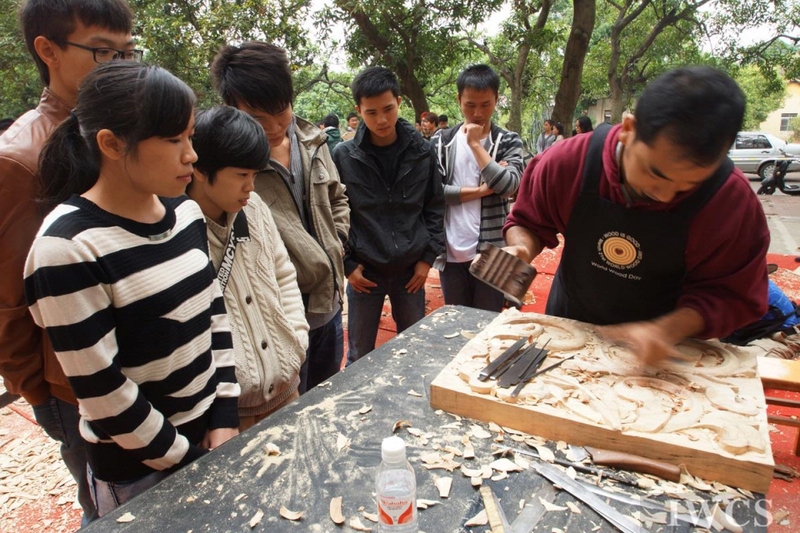 20 students from the university also joined the carving team for the festival, while learning and communicating with the artists. 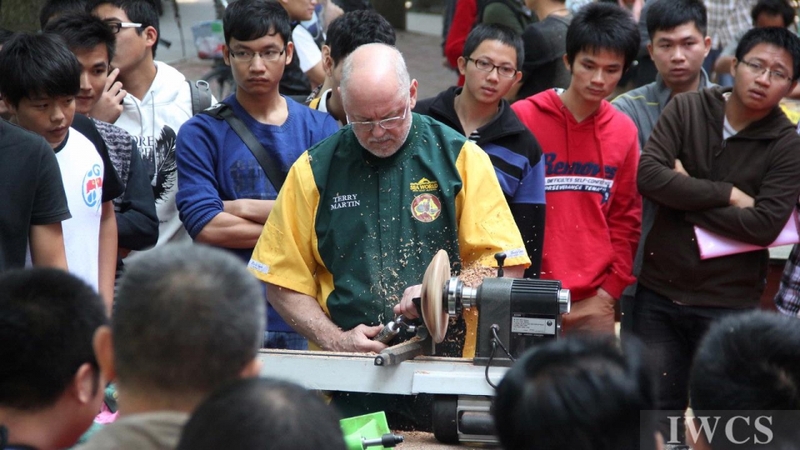 More than 200 students pursuing majors in wood science and technology took part in this activity. 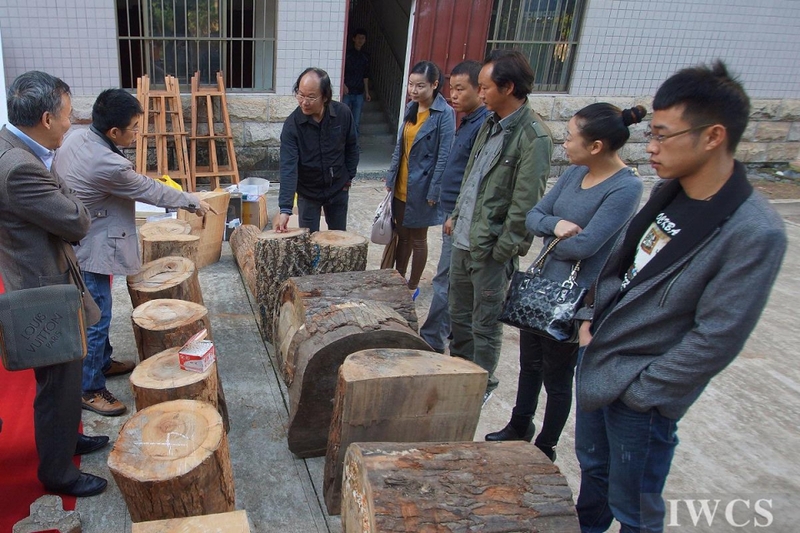 In tandem with the exposition and festival, Mr. Yang Jinrong, expert of Chinese Hongmu art and culture, and Mr. Terry Martin, Australian wood artist, gave the students two very impressive lectures.It was a good opportunity for the students to communicate with professional wood carvers face-to-face, and also to start the process of combining wood science with culture. 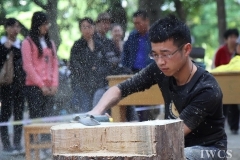 Wood carving, as an art form, has taken its place on the campus. 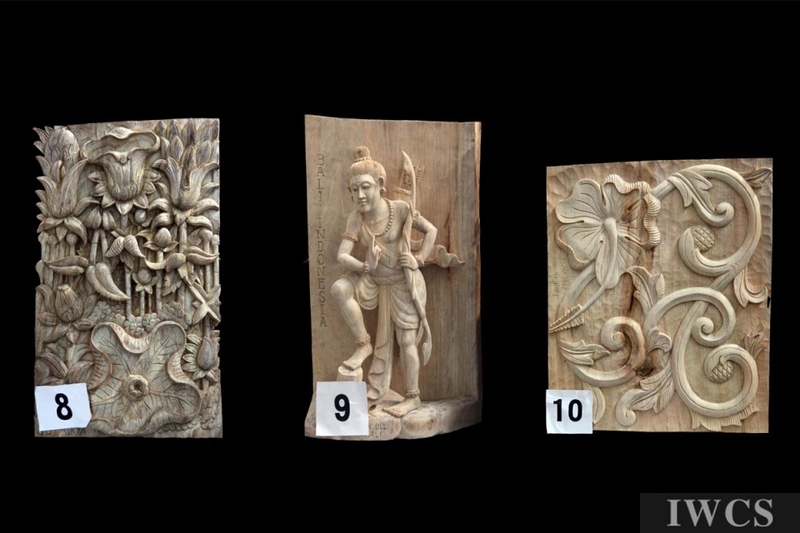 The 11 sculptors were from different cultural backgrounds and use different carving styles, but all of the works were created under the same theme, Homeland, and they all used the same scented wood, Camphor.The art works of the 4 artists from ASEAN countries reflected their lifestyles and beliefs. 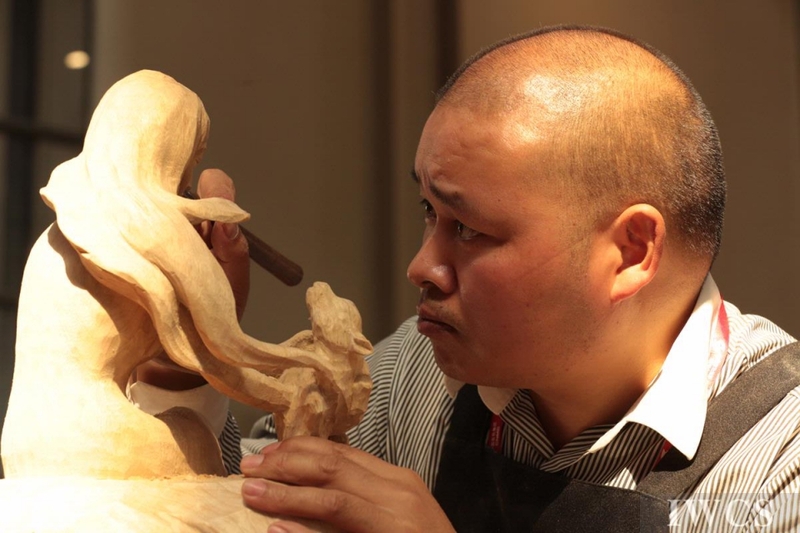 They shared the history and culture of South-east Asian countries with us.Malaysian artist Taufik carved the national flower of Malaysia, the Bunga Raya, while Indonesian artist Sutarya Hrfsor carved the Lotus Flower that is common to both Buddhism and Islam. 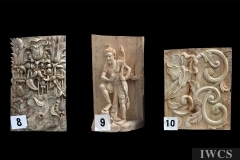 Indonesian artist I Kadek Parta selected the Ramayana story from Indian history. In the Chinese group, the 7 artists came from Dongyang and Yongjia of Zhejiang province, Xianyou of Fujian province, Lushan of Sichuan province, and Jianchuan of Yunnan province. 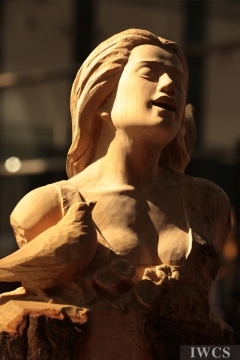 Their creative works combined modern and traditional skills, reflecting their feelings and dreams about homeland. 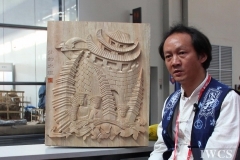 Both Xu Yongping and Jin Liquan chose the subject of mother to show their ideas about homeland. 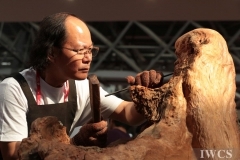 Zheng Guodi used the Chinese traditional subject Three Sheep keeping watch on the home. 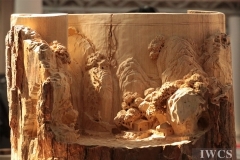 Yang Huanpei’s carving was like a poem and depicted his fantasy homeland, Dali. 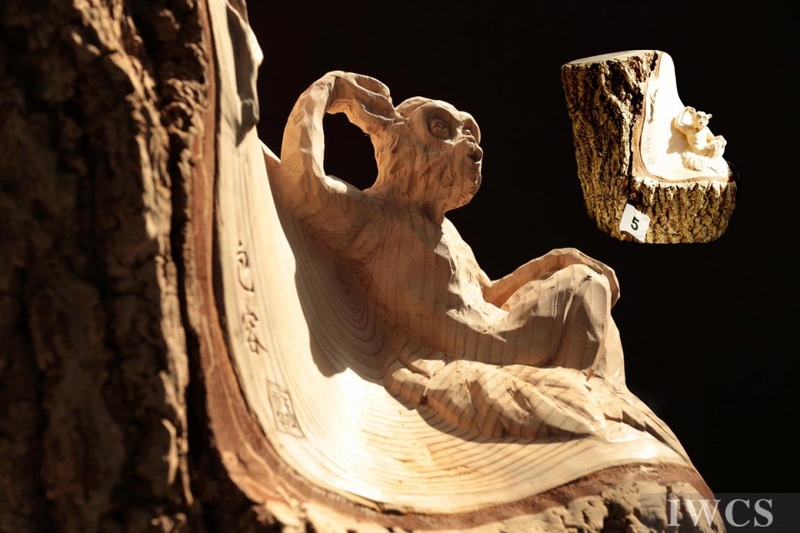 Wang Haibo, from Dongyang, Zhejiang province, was the youngest wood carver. 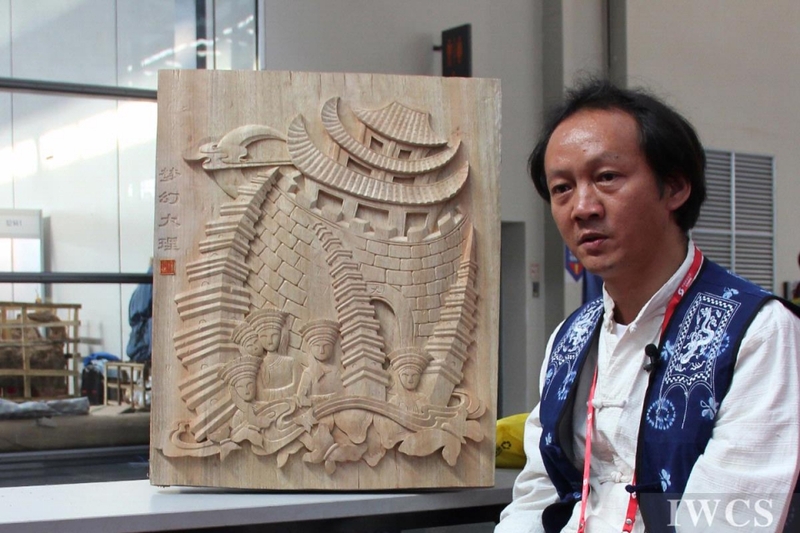 He applied Dongyang relief carving skill and used his lively imagination to present us with a Chinese traditional scroll painting, a whole dreamland picture of Peach Blossom Valley. 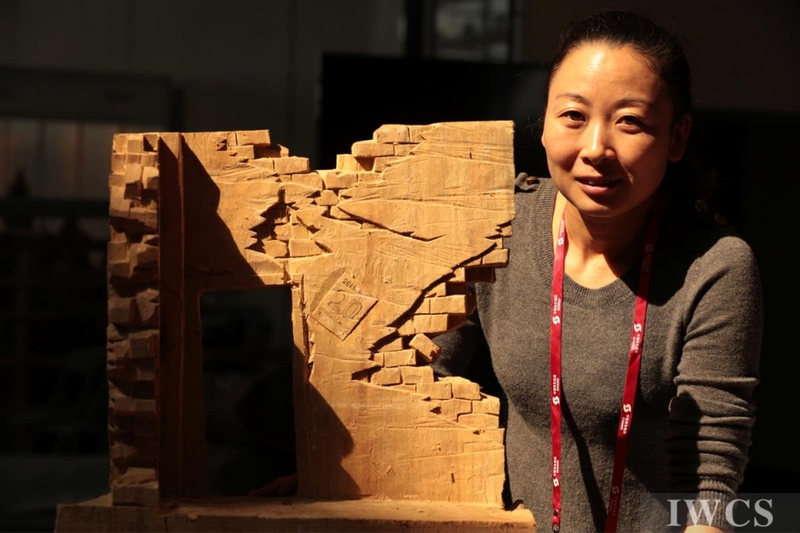 Wu Xiaomei’s piece was particularly thought-provoking. 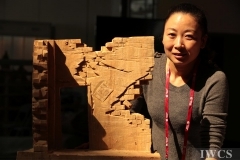 She showed us a broken house after the earthquake this year in Sichuan, quite a courageous choice. 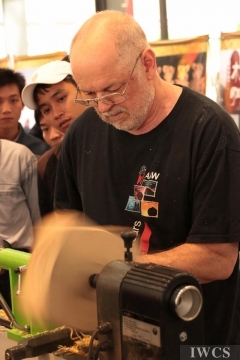 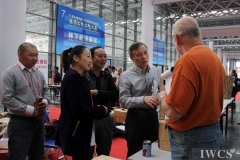 During the event, Terry Martin, Australian wood artist and a representative of the American Association of Woodturners showed his splendid woodturning technique to the audience in Guangxi University and CAEXPO. 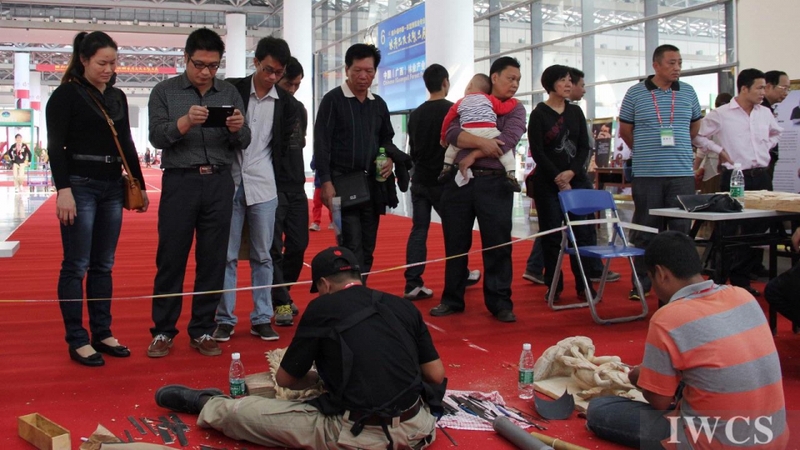 His demonstration aroused considerable interest among the crowds. 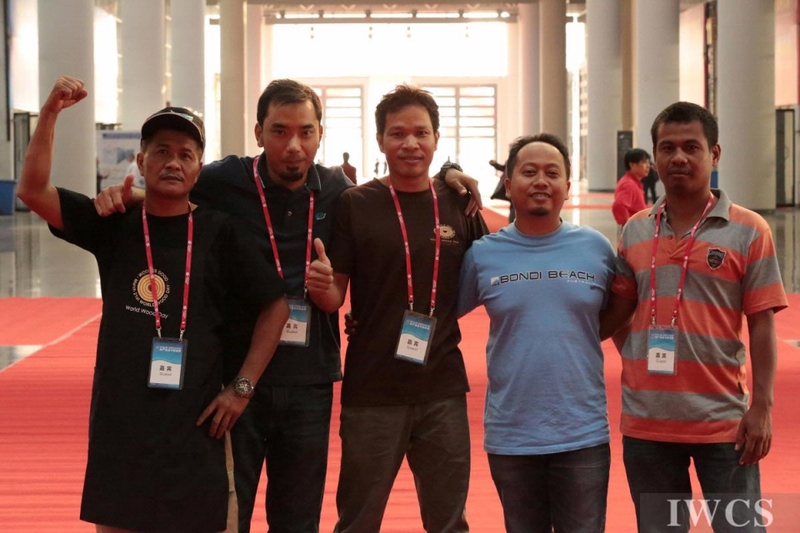 After Guangxi University, the 2013 China-ASEAN Live Wood Carving Exposition continued at the International Conference and Exhibition Center on 15-17 November, and was a highlight of the Forest and Wood Products Expo. 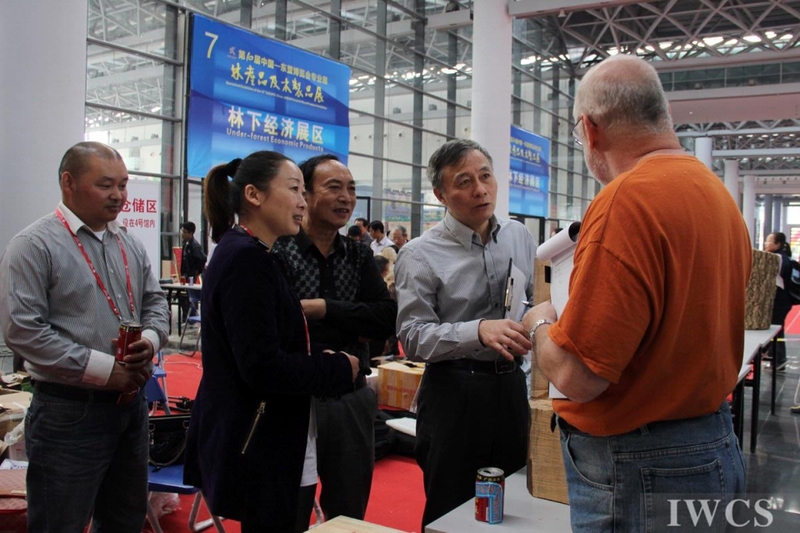 Mr. Terry Martin, Mr. Feng Wentu, Master of Chinese arts and crafts, and Mr. Yang Jinrong, expert of Hongmu art and culture, were the judges. 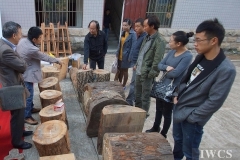 Zheng Guodi, Yang Huanpei, Sutarya Hrfsor, I Kadek Parta, Taufik and Duangmala Wanlop won prizes for “Outstanding Traditional Value”; Xu Yongping and Jin liqun won prizes for “Special Design”; and Wang Haibo, Wang Guohua and Wu Xiaomei won prizes for “Special Creativity”. 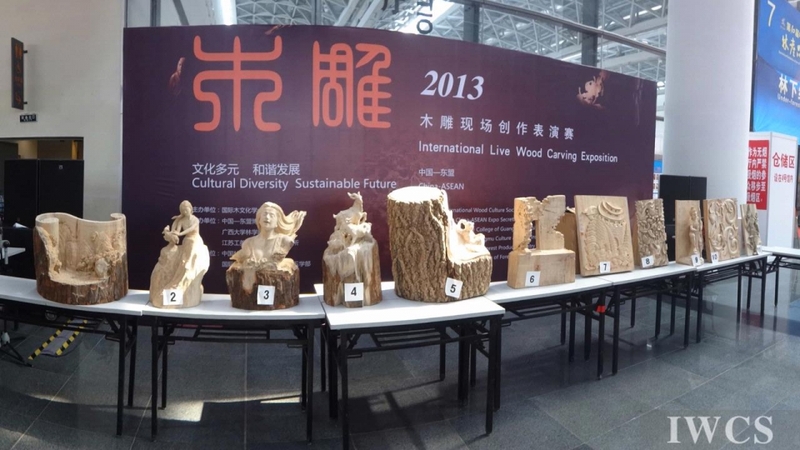 The 2013 China-ASEAN Live Wood Carving Exposition was organized by IWCS, and co-organized by the China-ASEAN Expo Secretariat, Forestry College of Guangxi University, and Jiangsu Hongmu Culture and Arts Institute, and Supported by the China National Forest Products Industry Association, IUFRO-Division 5. 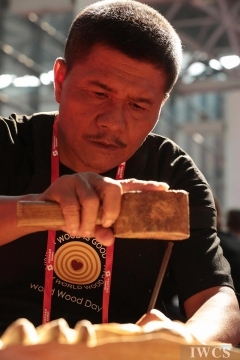 Concurrently with the wood carving exposition, IWCS also organized the 4th China-ASEAN International Wood Culture Forum. 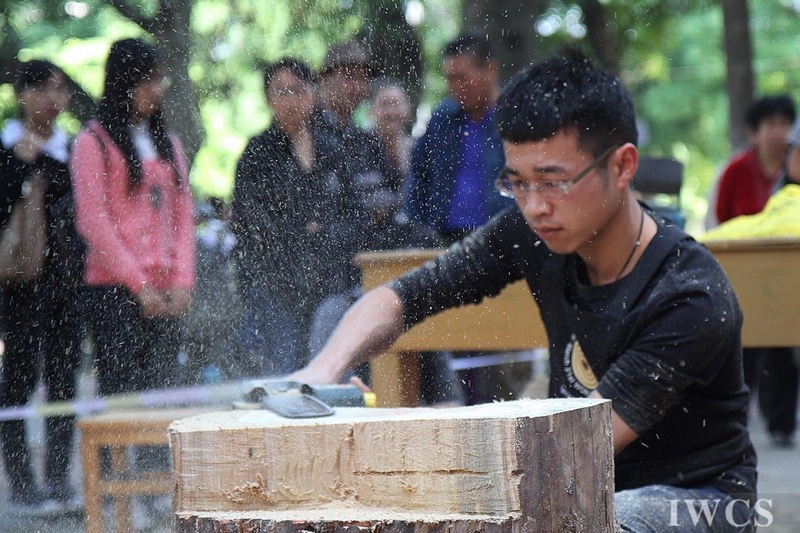 Both activities promoted communication, basic academic research and the practice of wood culture in the China-ASEAN area and contributed to the integration of art and culture into the Forest and Wood Products Expo.